UGG Girls I Purl Boot Baby Pink 1 M US Infant. Condition is New with box. This bootie is naturally adorable - knit from soft cotton and lined with plush wool. A hook-and-loop closure lets it go on and off with ease, and the sole provides some traction for when those little feet start walking. UGG Australia Bailey Bow Suede Boots. Do you have a stylish little kid?. Very soft. Includes box. UGG Navy Blue Fleece Booties. Infant Baby Boy Size 0-1. 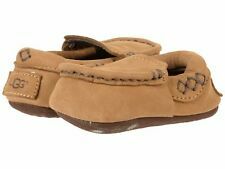 UGG TAN PINK VELCRO SLIP ON BABY SHOES, SIZE 0/1, NEW AND SO CUTE!!!! NEW WITHOUT BOX TAN AND PINK BABY GIRL UGG BOOTIES, SIZE 0/1. SO PRECIOUS! Ugg Boots Size 2 little kid size color is chestnut suede (not toddler). very little use good condition. Fair - Moderate wear and flaws. Appears well worn. Good - Little wear and flaws. Appears regularly worn. Very good - Minimal notable wear. Few flaws. Poor - Heavy wear and obvious flaws. Approaching end-of-life. NEW TODDLER INFANT BABY UGG 2019 BOOT KEELAN GLITTER GOLD ORIGINAL 1096313I. They velcro open on both sides to easily get on baby's foot. They're BRAND NEW! My family bought these for my baby, but she outgrew them before cold weather. Toddler Girl Ugg Bailey Boots Tan Size 7. Condition is Pre-owned. Shipped with USPS Priority Mail. Condition is New with box. classic cold-weather boot lined with genuine shearling will keep feet dry and warm, cushioned by an UGGpure™ foam footbed made of pure wool. A spunky pink Treadlite by UGG™ sole provides the future's brightest with lightweight stability in every step. Model: 1095571T. Color: Chestnut. Condition: New with defects, distressed box. our error. We are not an authorized dealer of this product and any warranty included with the product may not be honored by the manufacturer. ugg Kids Jacket. Condition is Pre-owned. Shipped with USPS Priority Mail. UGG T Drex toddler shoes size 9 with mustache & sunglasses . Condition is New with box. Shipped with USPS Priority Mail. Baby girl UGG boots size small (6-12 months) Pink Color. Condition is Pre-owned. Shipped with USPS First Class Package. toddler boy uggs. Condition is Pre-owned. Shipped with USPS Priority Mail. New Uggs Toddler Girl Black Glitter Boots Size 6. Shipped with USPS Priority Mail. Baby Girl Uggs - Pink With Bow. No box. Size: US 2/3. Shipped with USPS First Class Package. UGG Australia Girls Kids 7 Toddler Rain Boots Size purple with butterfly nice! UGG Australia Girls Kids 7 Toddler Rain Boots Size purple with butterfly nice!. Condition is Pre-owned. Shipped with USPS Priority Mail. Girls UGG Australia Pink Sparkle Velcrow Boots. Toddler Size 8 USA. Toddler Size 7 UK. Toddler Size 25 EU. Color: Pink. SIZE: Large 4/5. Wipe clean only. UGG Australia Infants Erin Boots 5202 Chestnut Size Small US 2-3 (6-12 months). Condition is New with box. Shipped with USPS Priority Mail. UGG Erin Boots. Size small (6-12 Months). Baby girl ugg boots. Condition is New with box. Shipped with USPS Priority Mail. Worn once in house. Toddler girl ugg boots new with box size 7. UGGs With Light Purple Bows on back. Toddler Size 6. Worn only a couple times. She just skipped two shoe sizes so my loss is your gain. Condition is Pre-owned. No box. Will ship in bag. UGG Boots Booties Baby Girl M Soft Leather Fur Tan/ Brown. Condition is Pre-owned with lots of use left. Shipped with USPS First Class Package. Lot Of 5 Toddler Girl Boots Size 5. Condition is Pre-owned. Shipped with USPS Priority Mail. Leather and jute. Rubber outsole. 3.25” shaft height. UGG T BAILEY BUTTON SIZE 7 CHESTNUT . Condition is New with box. Shipped with USPS Priority Mail. Brand New Never worn just open to take pixs. 100% Real Uggs . Do your Homework and read up on how to spot fake Uggs. All the Uggs I have Where bought through a authorized dealer that was closing his doors for good. Leave a message and tell me what your looking for. I might just have them. Also YOU CAN SCAN THE BOX PIC WITH GOOGLE LENS OR A APP YOU USE. Ugg classic Toddler Size 8. Condition is Pre-owned. color may appear different in person, see all pics before purchasing, from a pet fiendly home. UGG Australia Bailey Button Leather Boots. Pink Uggs Sandals Baby Girl Size 5. Condition is Pre-owned. Shipped with USPS First Class Package. Baby girl ugg boots size 0/1 great used condition super cute Condition is Pre-owned. Shipped with USPS Priority Mail.